Bug checker tools for Java require fine-grained heap abstractions including object-sensitive call graphs, field information for objects, and points-to sets for program variables to find bugs in source codes. However, heap abstractions coined commonly as points-to analysis, have high runtime-complexity especially when the points-to analysis is context- sensitive, and, hence, state-of-the-art points-to analyses do not scale for large code bases. 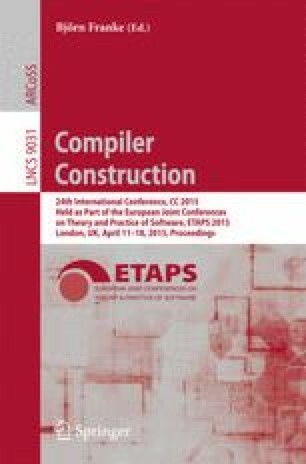 In this paper, we introduce a new points-to framework that facilitates the computation of context-sensitive points-to analysis for large code bases. The framework is demand-driven, i.e., a client queries the points-to information for some program variables. The novelty of our approach is a pre-analysis technique that is a combination of staged points-to analyses with program slicing and program compaction. We implemented the proposed points-to framework in Datalog for a proprietary bug checker that could identify security vulnerabilities in the OpenJDKTM library which has approximately 1.3 million variables and 500,000 allocation-sites. For the clients that we have chosen, our technique is able to eliminate about 73% of all variables and about 95% of allocation-sites. Thus our points-to framework scales for code bases with millions of program variables and hundreds of thousands of methods.